In the summertime in India, I grew up drinking baflo. It’s popular in Gujarat and made from green mangoes. Baflo packs a fresh punch of flavor unlike anything else you’ll taste. The raw mango is tempered with raw Indian sugar and cumin spices it up. It’s a thick drink enjoyed cold which cools you off and helps prevent heat stroke, too. I finally found green mangoes here in Seattle, and the weather was warm, so the time was right! Make sure your mango is green i.e. raw on the inside. Most Indians will use raw mangoes to make pickles — Indian pickles that is, the delicious sweet, salty, & spicy relishes. 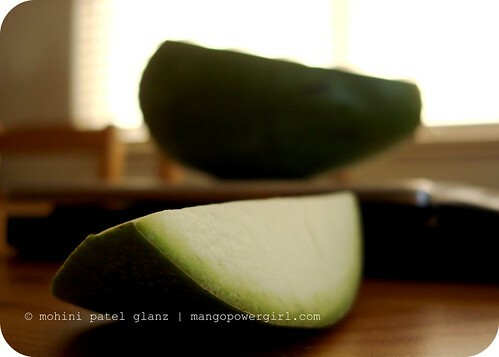 Lots of mangoes can look green on the outside, but mango for baflo or for a pickle must be green when you cut it. Baflo is made differently by different families, and measurements will vary based on the mango’s size and tartness, too. Here is my approximation for baflo like I savored in the hot summer. 1. Boil the mango in a steamer or a pot, till it is completely cooked from inside. You can check by inserting a knife to see if it feels soft, else let it cook longer. 2. Let the mango cool for a few minutes, then take the peel off by hand and discard the peel. 3. Take all the pulp off the pit and put the pulp in a blender. 4. Heat up the jaggery in a cup of water, till it all melts nicely. 5. Add the jaggery syrup to the blender, then add salt, cumin, and purée. 6. Add the rest of the water, mix, then adjust the sugar and salt based on the tartness of the mango. 7. Once you have the taste you like, strain the mixture through a fine sieve or strainer. 8. Pour your baflo in a bottle or a jar which can close tightly, then chill it in the fridge. 9. Serve the drink once it’s really cold and/or with ice cubes. 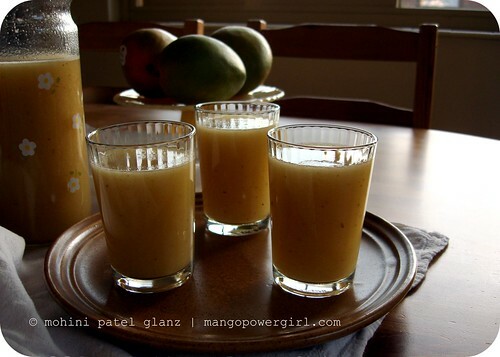 It will have a thicker consistency than regular juices, so serve in small amounts. This drink should keep well in the fridge for 5-7 days. Oh yum. I know I would love this!! Thanks for sharing my friend. You know cumin rocks!!! This sounds delicious MPG. Right up my alley! I love using green mangoes in coleslaw with a lime vinaigrette or in a Thai style “som tum”. Thanks for sharing. My dad loved baflo growing up in Gujurat. Maybe next year I will make him some. Oh wow that flower look awesome……Green mango drink sounds tempting…. Hi Mango Power girl. This drink looks delicious. I love mango and have your site bookmarked. I check it all the time! Recently I visited a tropical fruit park with over 140 types of mango and ate a ton and came away with a horrible rash all over my arm. have you heard of this mango allergy? Is it common in India? Is it from the peel? Has anyone else mentioned this? The rash broke out in blisters and I also had a few blisters around my lips. Strange. Anyway I still love mangoes and will still eat them (cautiously.) I wonder if green mangoes are more potent. Thanks! Super neat! A yum recipe for what those of us from Maharashtra call Panha. I can't remember the last time I had it. I've never tried to look for raw Indian mangoes here in CA before. Yum, kairi!! Hmmmmm…. I have GOT to try this. I can practically taste the warm weather and sweetness through your beautiful photos! I just made this today and I see this here now. I know this as Kairee Panha. :) It is such a refreshing drink to have on a hot summer day. We have something that looks just like this, but call it aam ka panna.